This past weekend was such a busy one! We ended up celebrating Mother's Day on Saturday. We brought both families (mine and shawns) together and made a feast for them. Shawn did most of the work as I spent my time focusing on Grandma Paige's 90th Birthday Cake! On the menu for Mother's Day dinner was Lots O' Meat Lasagna, Chicken Alfredo, and Spagetti and Meatballs. As always Shawn did a wonderful job! I love having a boyfriend who loves to be in the kitchen just as much as I do! It was so great to spend time with both families. I was a bit nervous that it might be a little awkward since it was the first time they'd be meeting each other, but it went much better than expected! It was definately a success. 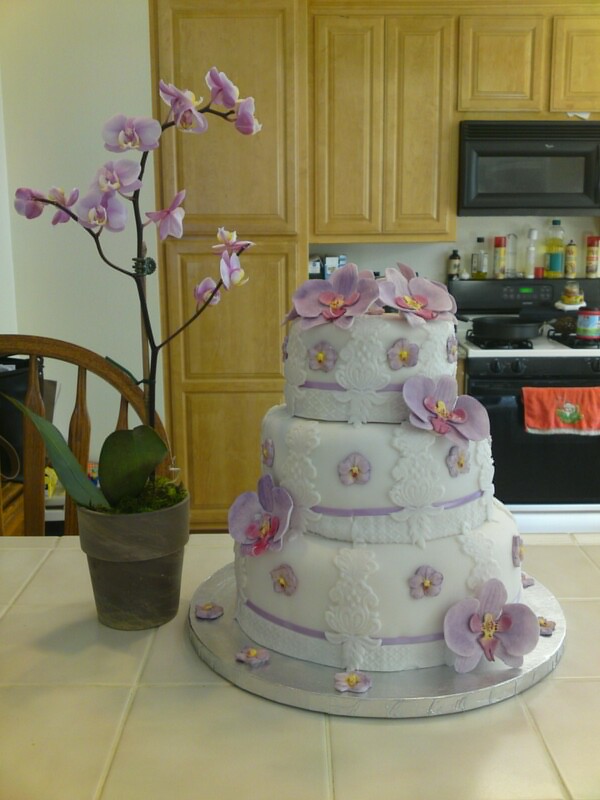 Once everyone left I went back to working on the Orchid Cake. Being the perfectionist that I am I wasn't totally pleased with the end result, but it was beautiful. It was definately the most difficult cake I've ever made but was totally worth every minute. Shawn's grandmother Paige turned 90 years old on May 7th and the cake was for the huge they had for her on Mother's Day. She is one of the sweetest ladies I've ever met. I am so happy I was blessed with such a wonderful talent that I could share with her on such a special day!